For young and old, come and enjoy a fun and original moment thanks to the toboggan run. In paret, yooner, bob, airboard or zipfy, a thousand ways to rediscover the thrills offered by this activity! Hike first, but above all, slide through snowscapes of Le Revard ! Follow the Enduro-Airboard Parcours with its slopes, lay down face downward and head forward on this inflatable toboggan. 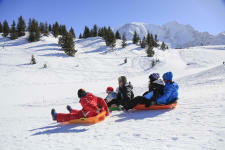 At the end of the day, when slopes of the Semnoz ski resort close on the hills of Annecy, we offer you a fun and unique moment : downhill in Savoy toboggan the paret. 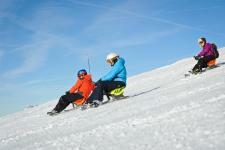 In the morning, through the Revard mountain pastures, near Aix les Bains and Chambéry, enjoy a family and funny activity thanks to the supervised downhill in Snow Bob.